Fearing the first frost last night I picked the last of the squashes, pumpkins, call them what you will. The butternuts were, as usual, pretty much a failure, only starting to form fruit in September which then had no time to mature before the weather got colder. This variety was the early selection of Waltham Butternut, offered by Realseeds. It did better than my last couple of attempts with seed from other places and perhaps the cold spring and lousy summer didn't help but it still hasn't solved my problem with butternuts. I'm not sure I'll try again, at least until I have some sturdy deer proof cloches that might help me get an earlier start to the season. The Melonette Jaspée de Vendée was very quick by comparison, pretty much finished by late August and producing in the region of 10 useful sized fruits from just a couple of plants. 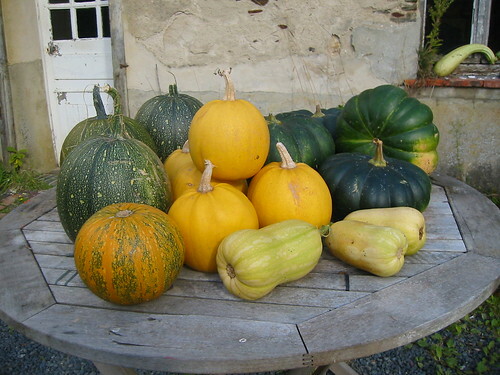 These are not huge pumpkins but ideal for smaller households and pleasantly sweet to eat. They keep well too. Unfortunately I was using up the end of a packet of seed, didn't try to save any squash seed this year and now can't find many suppliers on the net so this may be the last year for this one for a while until I can source some new seeds. I bought in plants of the moschata, one of the reasons I didn't bother to try to save seed this year. I think the variety was 'Musquee de Provence' and the fruits are certainly what I was expecting, solid, heavy and a beautiful orange inside. These are definitely one of the best for all sorts of cooking. They also keep quite well, gradually changing colour from very dark green to an off gold, bronzey colour. The problem with them is that they do contain so much flesh, it's difficult to use up a whole one without an army to feed. Finally, the Pumpkin Nuts. I wrote about these already here. The little greeny orange fruit at the front left is how they look when properly ripe. All the larger fruit cracked before they were finished, some of them quite dramatically around the body as well as at the base. I'm leaving them to cure for as long as I dare before taking the seeds but these don't seem to be the right variety for us to use as our hull less pumpkin seed choice. Again the very wet summer may have contributed to the problem but that's quite likely to happen again. Apart from the butternuts, given the weather and the very poor patch of land I gave them to grow in, all the varieties did pretty well and they are struggling on, poor things, with tiny fruit that will never come to anything still forming on the vines. Next year I want to grow some more colourful varieties and I'd also like to have another go at Crown Prince but I can't find a supplier who offers open pollinated seed of these, they are all F1, not much use for the seed saver. Anyone know anywhere that I might be able to get some? Hi Leigh, thanks for the compliment and the tip. I'll look out for them although I'm pretty much resolved not to bother with butternuts for next year. This is partly because I hope to save seeds from the Moschata de Provence that I love to cook with and the butternuts are also a moschata type. I know I can mess around with tape and hand pollination but it's much easier to be lazy and only grow one variety of each squash species, maxima, mixta, moschata and pepo.